The moment you feel a chill in the air, certain ingredients find their way into our favorite baked recipes. Warm spices like cinnamon, ginger, and cloves come together in a magical combination that pairs perfectly with sweet molasses and brown sugar. Molasses is the dark, syrupy by-product of extracting sugar from sugarcane. It became a popular sweetener for baked goods in the early 20th century and remains a staple of American cuisine to this day. The recipe for these molasses cookies will carry you from the time when the leaves begin to change, all the way through the Christmas season. 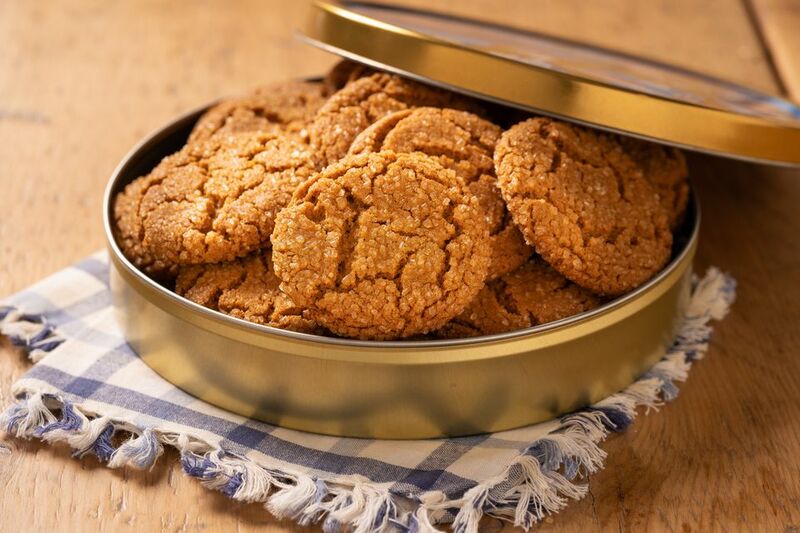 When layered in your favorite decorative tin, these festive molasses cookies also make for a great holiday gift. Add a nicely printed recipe card and a bow, and you are all set! If you plan on a cookie baking blitz, the dough can be prepared in advance, then wrapped and chilled until you are ready to bake. The dough is formed into balls and then rolled in turbinado sugar. This is a raw coarse sugar that is available at most grocery stores. If you can’t find it, the cookie dough balls can also be rolled in regular granulated sugar. Turbinado does add an added wonderful crunch and texture, however. Plus, when these molasses cookies are rolled in turbinado sugar, they sparkle. In the large bowl of an electric mixer, cream together softened butter and brown sugar. Beat in egg and molasses until well-combined. Stir together flour, baking soda, cinnamon, ginger, cloves, and salt. Add dry ingredients to butter mixture and blend well. Gather dough into a ball, wrap in plastic wrap and chill for at least one hour. Form dough into 1-inch balls and roll each in turbinado sugar to coat. Place on baking sheet and bake for 12-15 minutes or until golden around the edges. Note: Turbinado sugar is available at most grocery stores. If you can’t find it, the cookie dough balls can also be rolled in regular granulated sugar.